Fingers contain three bones called the phalanges (pleural of phalanx), which are called the proximal phalanx (closest to the palm), the middle phalanx and the distal phalanx (closest to the nail). The joints between the phalanges are referred to as the interphalangeal (IP) joints. Each IP joint has a name; proximal interphalangeal (PIP) joint is located between the proximal and middle phalanx and the distal interphalangeal (DIP) joint is located between the middle and distal phalanx. The thumb consists of two phalanges and one IP joint. Forearm muscles attach to specific points on the phalanges via their long tendons to facilitate flexing and extending finger movements. The flexor digitorum profundus (FDP) muscle is one of the forearm muscles, which gives off four tendons that travel through the carpal tunnel in the wrist and attach to the distal phalanx in each of the four fingers. An injury to the FDP tendon at its point of attachment to the distal phalanx, when there is a forced extension of the DIP joint during active flexion, is called the "jersey finger. "(Figure 1). This injury most commonly occurs when an athlete’s finger catches on another player’s clothing while that player is pulling or running away. The tip of the finger at the DIP joint is unnaturally hyperextended while the proximal portion of the finger is flexed. This causes the FDP tendon to partially or completely rupture at its attachment point with or without an avulsion fracture. The ring finger injury accounts for majority of jersey finger cases. 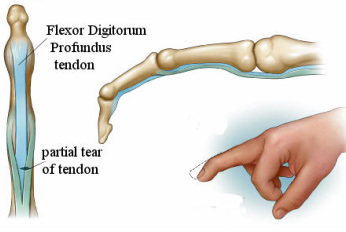 When the FDP tendon is completely ruptured, the affected digit cannot bend at the DIP joint without assistance. In addition to pain, bruising and swelling, jersey finger symptoms may include a popping sensation in the finger at the time of injury, or a lump in the finger or the palm. Figure 1. Jersey finger with partially torn FDP.